A pole sign can help direct traffic to your business and communicate the message of a single or multi tenant business. Often a pole sign is customized to identify shopping plazas, car dealerships, gas stations, restaurants, and retail locations. A pole sign can come in a variety of shapes and sizes, is supported by a center steel pole, and usually has a lighted cabinet on top. Styles of poles, cabinets, and faces can vary depending on the client and location needs. The overall finished product depends on your company’s individual brand guidelines and preferences. 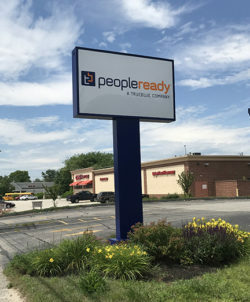 Due to the presence of other stores with signage within a very close proximity, PeopleReady decided to use a pole sign to stand out. This single pole sign gets a better share of attention versus surrounding businesses with smaller, less effective signage. PeopleReady decided to wrap their pole to give it a different look over a typical pole shape. PeopleReady uses different combinations of signage at each location based on each unique area. They understand that in order to maximize their brand and visual awareness of each of their locations, they need to leverage multiple types of exterior signage. 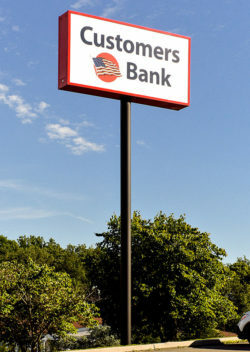 Customers Bank took advantage of this pole sign to tower over nearby trees and to grab the attention from the high volume traffic in the neighborhood. Much like PeopleReady, this single pole gave Customers Bank a height advantage over the surrounding buildings and signs. Pole signs can be challenging projects to undertake by yourself, especially when you are negotiating permitting while managing both design and construction. At Egan Sign, we are able to take that stress out of this process with the Egan Sign 360. We work with your company to facilitate your signage projects. This puts time back in to your company where it belongs, so you have less to worry about. If you think a pole sign would be a good fit for your next location or if you simply have questions about this type of sign, please contact us to start a conversation about your next on premises sign package.